Arlington Public Schools commissioned Bowie Gridley Architects to design a replacement facility for Wakefield High School. 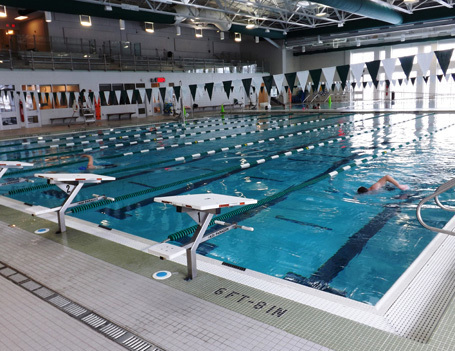 The $85 million project includes an aquatic center, auditorium, media center, the main administrative spaces, and the town hall meeting room. The upper two floors of the academic wing contain classrooms and other student-focused spaces. The lower floor of the athletic wing contains the main gymnasium, lockers, a fitness room, and other athletic spaces. Depths ranging from 4 ft. to 7 ft. Depths ranging from 3 ft. to 12 ft.
Wakefield High School received LEED Gold certification with the U.S. Green Building Council. Highlights of the center’s sustainable initiatives include: solar hot water panels, rain garden landscape feature for on-site storm water management, recycling construction waste, low-emitting materials to create high indoor air quality, and waste heat from mechanical system used to heat the pool.